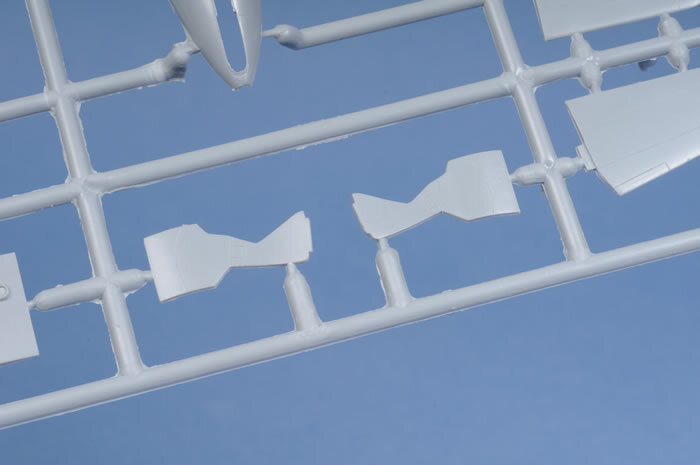 Contents and Media: 38 parts arranged on two sprues of grey styrene; 1 part in clear styrene; 16 resin parts; a photo-etched fret and acetate sheet; decals for three subjects. Advantages: Beautifully detailed resin and PE improvements on the MPM original. Kit version represents Bundesmarine modification. Excellent decals. Disadvantages: One-piece canopy. Cannon ports and tail pipes need to be drilled out. No intake baffles or duct detail. If one considers the evolution of Hawker aircraft designs inspired by the great Sir Sydney Camm, the Hawker Sea Hawk takes its place as the missing-link connecting the prop driven Hawker Sea Fury and the jet powered Hawker Hunter. Although the connection to the Hunter is more obvious, this design actually germinated from th idea of making a jet powered Sea Fury. With Hawkers attention shifting to the development of the Hunter after 30 airframes had been completed, the majority of Sea Hawks were made by Hawkers subsidiary Armstrong-Whitworth. Like the Sea Vixen, the Sea Hawk design was rejected by the RAF but taken up by the Admiralty and the Sea Hawk became the first high-performance jet fighter to serve with the Fleet Air Arm, replacing the unconventional and unsatisfactory Supermarine Attacker. The prototype first flew in September 1947 and the production aircraft, the Hawker Sea Hawk F1 first flew in November 1951. This was the beginning of an illustrious career with the FAA spanning eight years of frontline service in which it was tested in battle during the Suez crisis “Operation Musketeer” of November 1956. The Sea Hawks were used in the ground-attack role, in which they excelled. After being retired from frontline service (replaced by the Scimitar and Sea Vixen), the Sea Hawk remained with the Royal Navy Fleet Requirement Unit for a further decade, finally bowing out in 1969. The Hawker Sea Hawk was also exported and saw service the fleet air arms of the Netherlands Naval Air Service (Marine Luchtvaartdienst - MLD) as the Sea Hawk Mk.50, India (where they were again tested in battle… and performed well in the Indo-Pakistani War of 1965 and the Indo-Pakistani War of 1971) and with the Bundesmarine of West Germany. The German Navy (Bundesmarine) Sea Hawks were basically FGA.6 aircraft, but with a taller vertical tailplane. The order for 64 aircraft was evenly split between day fighters designated Sea Hawk Mk.100 and foul-weather/reconnaissance night fighters the Sea Hawk Mk.101, which were similar but carried a large radar pod on one of the underwing pylons. This is the subject of this kit by Special Hobby. These served until the mid 1960s until finally replaced by the F-104 Starfighter. By most measures, the Hawker Sea Hawk was an outstanding and successful aircraft design; conceived in 1944 its last production was in 1961. It served the naval air arms of four countries, was proven in battle and continued in active service until the early 1980s. 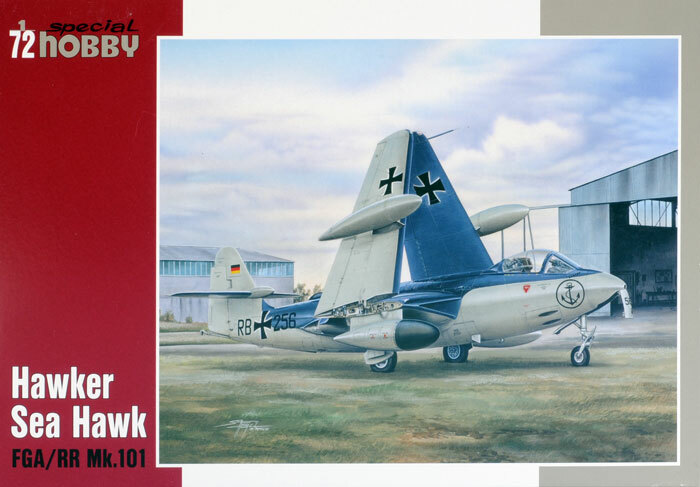 Special Hobby has literally re-boxed of the original MPM 1/72 Hawker Sea Hawk. When I say this I am not just referring to the contents.... Special Hobby now appears to be producing their kits in light weight but sturdy, top-opening boxes. This is a GREAT improvement on their old end-opening packaging which I found to be easily crushed... well done Special Hobby! Now what about the contents? The first thing I noticed was that the part sprues, resin and decals are all individually bagged, another tick for Special Hobby! Essentially this is the same as previous MPM releases of the Hawker Sea Hawk, the only difference now is the inclusion of resin details and the use of the alternative tailplane and addition of underwing fuel tanks and radar pod. 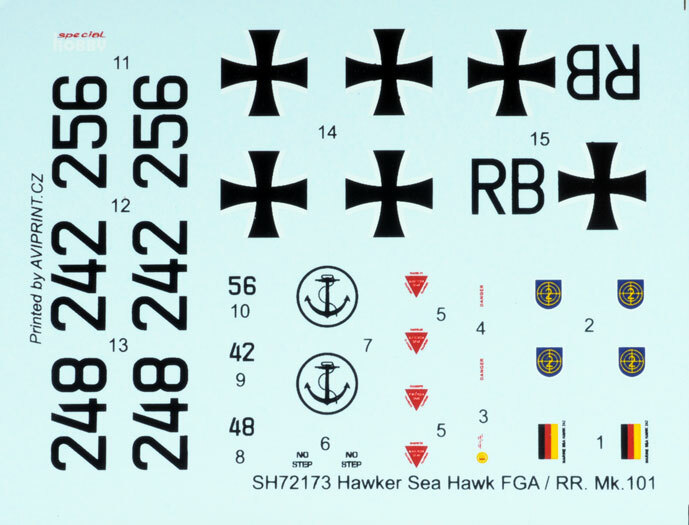 The 38 parts are arranged on two sprues of grey styrene and these contain all the parts required to make the basic model of the Sea Hawk. The fuselage is split horizontally between the nose and the jet exhausts, this section also includes the wings. The tail section is split in the more conventional vertical plane and in designing the kit this way the manufacturer has enabled the modeller to use the alternative rear fuselage, representing the different export version used by the Bundesmarine. The parts for the original rear fuselage are provided, but are not used in this version. These major parts are well moulded, with smooth surfaces and crisply engraved details. There is limited flash although there are few injector towers on the inside of the wings that will need to be removed before construction can commence. The main wheel well is cut out and includes a representation of a small section of the Nene engine. Detail is a little lacking here and the area could use some further “busying up”. The troughs for the four canons in the nose will also require drilling out. 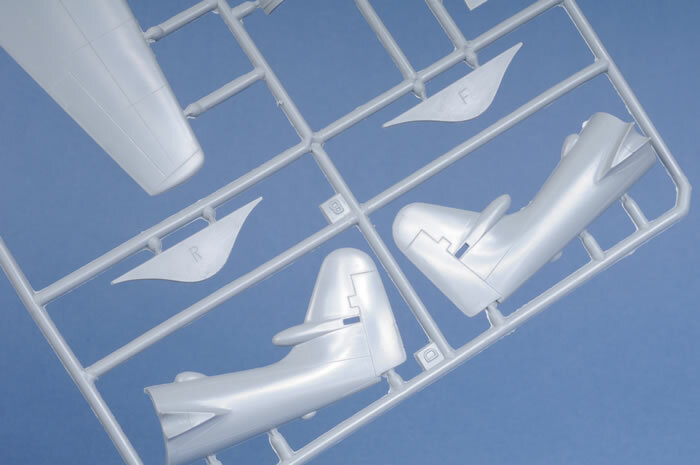 It was by taking the main parts off the sprue (the attachments will need care in their removal along the wing leading edge), that I found my major disappointment with this kit. The fit of the forward fuselage/intake area is a little less positive than I expected, however the real “clanger” was the complete absence of any detail for the wing root jet intakes. I am astounded that Special Hobby have gone to the trouble of providing a lovely set of resin detail improvements, yet have completely overlooked this area. 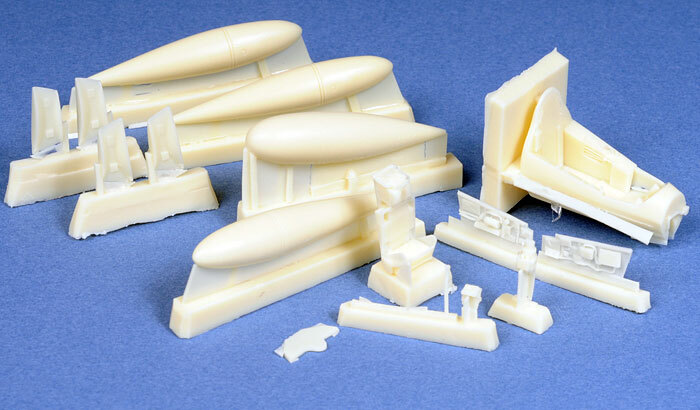 The modeller is faced with the choice of scratch building their own intake ducting and baffles or simply placing red intake covers on the offending section in order to avoid the dreaded “see through look” of kits from ages past. The 16 resin parts and the photo-etched fret are what really make this kit stand out. The modeller is provided with a highly detailed cockpit including tub, side panels and MB ejection seat, this is also supplemented with a P-E instrument panel. The underside of the cockpit tub also has the forward wheel bay integrally moulded. These replace the original basic but effective styrene parts. The other resin parts provided concern the underwing external fuel tanks and “Echo” radar pod. All the resin parts are beautifully rendered and free from bubbles or miss-moulding. 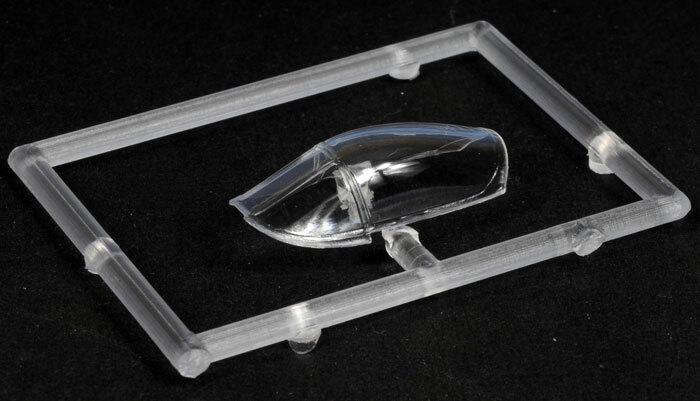 There kit canopy is clear, thin and free of distortion, however, it is moulded as a single piece. This another minor frustration, as Special Hobby have thus “hidden their light under a bushel” and all that lovely cockpit detail is under a closed canopy....why? Careful work with a razor saw will be needed to open it up or a vac-form replacement sought. The decals are beautifully printed by AVIPRINT. The detail is fine and the register is perfect. Few stencils are provided, however that seems appropriate for the subject. The modeller is provided with the choice of three options, these all being aircraft serving with MFG 1 Bundesmarine between 1961-1965. All sport the same Extra Dark Sea Grey over gloss Sky livery, only the code numbers change (choose from RB-256, 242 or 248). All carry the same underwing ordinance. When the original MPM release of this kit appeared, the modelling world finally had a modern replacement for the aging FROG and Airfix kits of the Sea Hawk. 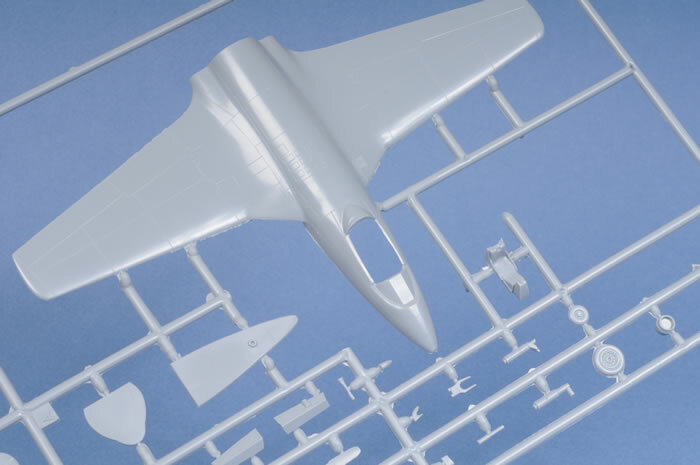 This kit is simply an improvement of that original release and offers an unusual alternative of a fine FAA jet fighter. I was going to say that this kit was pretty much perfect until I encountered the jet intake fit and detail issues. 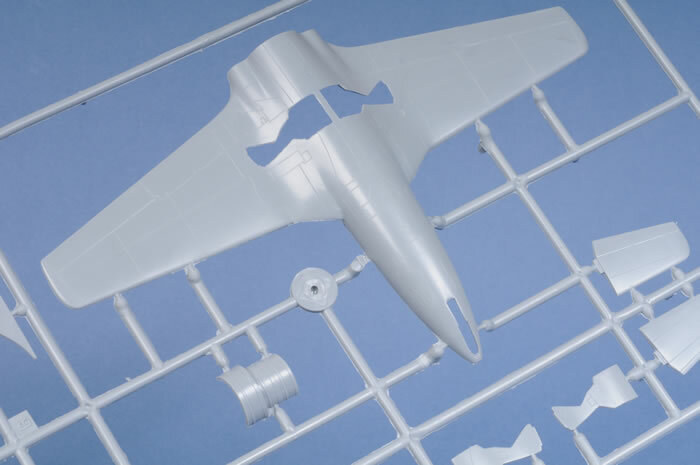 These and the single piece canopy are two improvement that have been overlooked yet could have been so easily corrected and would have made this an fantastic model. Even so, this will still produce a decent model of the Hawker Sea Hawk, but an outstanding result will need some extra time and effort. Now it would be nice for someone to do a decent Supermarine Scimitar or even an Attacker!